Because I know I can make a difference! I want to mix the experience I have developed so far in my career with that of the fantastic team around me, so together we can grow the NAA and support automotive industry in the UK for years to come. Since leaving university and my home town of Dublin, I’ve lived in Birmingham, Liverpool and China. With most of this time being spent in Liverpool, I do now sound a little bit scouse – which I blame on my girlfriend Katherine! Never in my life did I think I would call lunch, dinner, but there you go. What I love to do most is play football, but have been known to be a ‘jack of all trades’ when it comes to hobbies – surfing, boxing, climbing, tennis, carpentry to name a few. 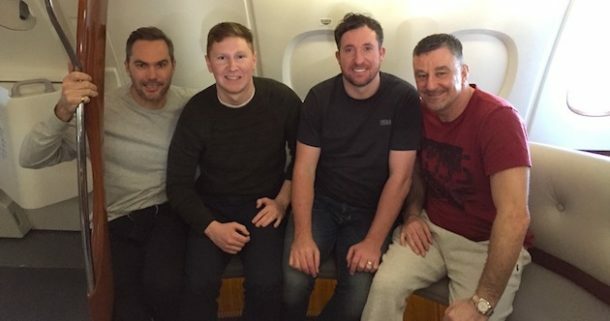 I’m a massive Liverpool fan (see photo with LFC legends McAteer, Fowler and Aldridge) thanks to my godfather who bought me the ’96 home kit many years ago! He said he made sure I became a Red to commemorate the Hillsborough disaster which happened the same day I was born. I love and appreciate all live music, regardless of genre. My most recent gig was the Liverpool International Music Festival at Sefton Park – a stone’s throw from where I live. I like movies based on real events, even though Hollywood tends to exaggerate the truth! Catch Me If You Can is one of my favourites, as I loved the book and Leonardo Di Caprio is my favourite actor. I love Irish literature, but have never been patient enough for Wilde or Yates. My favourite book is Angela’s Ashes (also a movie) and am currently reading An Unsung Hero – a biopic on the life of Antartic explorer Tom Crean. I only find time to read at night before bed, which I like as it keeps me off my phone! Watching the 2016 Shanghai Grand Prix was fantastic, even though I haven’t been a Formula 1 fan since the glory days of Schumacher and Hakkinen. Don’t be afraid to make a mistake! Just make sure you learn something from it.